Toyota 8-series Electric Reach Trucks revolutionize the way materials are handled when cube utilization is at a premium. From the versatility of the latest electronic control technology to the comfort and convenience of an ergonomically designed operator compartment, Toyota's 8-series single reach and double reach trucks represent a dramatic approach to reach truck performance and quality. Bubble mat padding absorbs vibration to reduce foot and ankle fatigue. Spacious Operator Compartment with 11" low step height eases frequent entry and exit during the work shift for reduced body fatigue. Cushioned Backrest, Armrest and Floor Mat are designed to limit fatigue and keep operators productive. Polyurethane Drive Tire absorbs shocks caused by uneven floors to allow for smooth traveling. 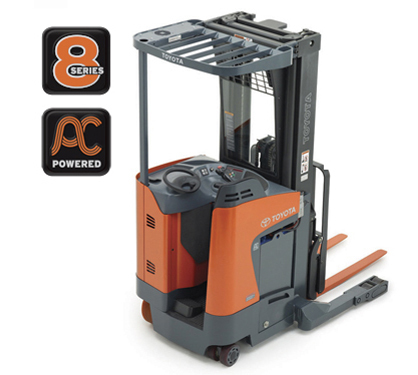 AC Powered System delivers precise speed and torque control loaded or unloaded. AC (36 volt model) Hydraulic Control System provides fully variable lift/lower control for fast, efficient and smooth operation. Multifunction Control Handle allows single-handed control of travel, lift/lower, tilt, reach/retract (including high speed), horn and optional sideshifter for simplified operation. Electronic Power Steering provides quiet, effortless and responsive operation for precise maneuverability. Self-Diagnostics help maximize forklift uptime by checking critical functions at start up. Built-In Analyzer provides easy troubleshooting and eliminates the need for an external hand-held analyzer. One-Piece Top Cover with interlocking door provides access to major components to reduce service time for inspection and maintenance. Bolt-On Toe Boxes allow for easy wheel replacement without taking the truck out of service for extended periods of time. Lift-Out Battery Gate and rollers facilitate fast removal and service. Dual Articulating Polyurethane Load Wheels offer excellent durability, especially on uneven surfaces, for improved performance. Unitized Frame Design provides optimum rigidity and strength on all 8-Series Reach Trucks. Model Load Capacity* (lbs.) Voltage (V) Baselegs Opening I.D.